1. Heat olive oil in a Dutch oven or large pot. Add onion and garlic and sauteé over medium heat until the onion is translucent. 2. Add all other ingredients except cheese and cook approx. 20 minutes or until chicken is cooked through. Add cheese and stir until melted and combined. Adjust seasoning to taste. 3. 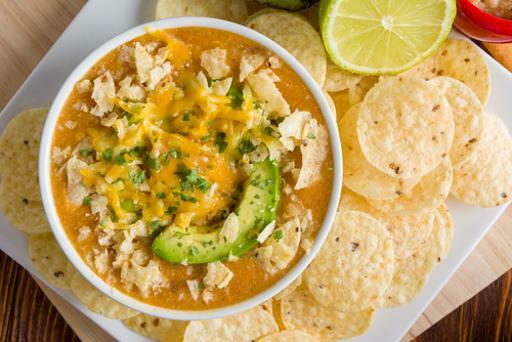 Serve with lime wedges, cheese, tortilla chips, jalapenos, sour cream, guacamole or your favorite toppings.